Catalytic combustor equipped wood stoves may look like any other wood stove. But they are designed to burn in a special way. The catalytic combustor is a ceramic honeycomb coated with a "noble" metal catalyst, such as platinum or palladium. Strategically placed in the smoke path inside a wood stove, the catalytic combustor literally causes smoke to burn as fuel, creating more heat from less wood. That means a wood stove can be burned slowly, transferring most of the energy stored in a log to the room as heat, instead of to the outside air as pollution. The catalytic combustor in your wood stove burns smoke so that your stove produces greater heat. If you operate a catalytic wood stove without its combustor, you cheat yourself out of warmth you would otherwise be getting from your wood stove. Engaging your combustor properly allows the fuel load to burn longer in the slow-burn mode. This may give you the benefit of heating all night long with one load of wood. Combustors help prevent build-up of hazardous creosote in flues and chimneys. People who remove combustors risk unexpected chimney fires with damage to property and danger to people in the home. Catalytic stoves are designed to operate at high temperatures only with the combustor engaged. lf you remove the combustor you may have an uncontrolled fire that may lead to eventual cracking of metal or damage to components, possibly rendering your stove inoperable. lf you operate your catalytic wood stove without its combustor, the stove manufacturer's warranty is instantly null and void. Operating wood stoves in any manner warned against in manufacturers' manuals, including without the combustor, may cause insurance companies to reject claims for damage or injury. Catalytic wood stoves are specifically engineered to operate properly with a combustor. You will observe dirty smoke emissions from your chimney if you operate your catalytic wood stove without its combustor. Removing or not replacing a combustor is false economy. Over time, the money invested to maintain or replace the combustor will pay off in improved performance with more heat from less wood and less frequent chimney cleaning. Federal law requires that EPA-certified catalytic wood stoves be maintained and operated with combustors to reduce air pollution over the entire life of the stove. the first few minutes after you light the fire. lf you notice excessive smoke coming out of the chimney, there may be a problem with the catalytic combustor. A catalytic probe thermometer used consistently during woodstove operation will let you know when catalytic performance is declining. Your chimney sweep or hearth maintenance professional has the training and equipment to perform maintenance tasks on your catalytic combustor such as removing soot and ash or replacing gaskets. lf the combustor should need to be replaced, your chimney sweep or hearth maintenance professional can provide and install the appropriate replacement model. lnformation courtesy of Condar Company, manufacturer of replacement catalytic combustors. Reprinted, with permission, from the April 2010 issue of The Chimney Sweep News, an independent trade magazine for chimney service professionals. Jim Gillam, editor/publisher. 541-882-5196. These stoves have a catalytic unit that actually burns off "unburned" gases as they exit the appliance flue collar. The catalytic combustor is a ceramic honeycomb that is coated with special metals. These metals lower the ignition temperature of the "unburned" flue gases as they pass through. This results in lower emissions and better fuel burn. These stoves currently emit less than 4.I grams per hour. Catalytic stoves also contain a bypass damper into the flue. This damper should be opened when the appliance is first started and whenever the appliance is loaded. When the catalyst reaches around 600 degrees, the bypass damper is closed and the gases are forced through the combustor for a clean burn. Most stoves have a catalytic thermometer that shows when to activate the catalyst. If not, a thermometer can be purchased and placed near the catalyst. 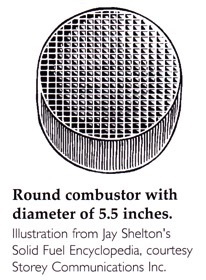 A catalytic combustor is a device designed to be built into or added to a wood stove. Its purpose is to reduce the temperature required to consume the particulate in the smoke so that a large portion of the flue gases will be consumed prior to entering the chimney. When properly incorporated into the stove design, a catalytic combustor significantly improves the overall efficiency and reduces the emission of pollutants into the atmosphere. Retrofits, or “add-on” catalytic combustors for existing stoves are not always as successful due to variations in stove design. 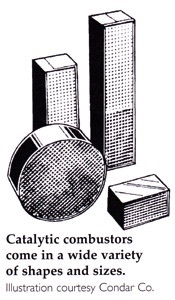 Catalytic combustors need periodic replacement, usually after 5,000 to 10,000 hours of use. You will notice a marked decline in the performance of your stove as the catalytic combustor nears the end of its useful life. It will also be necessary to maintain the combustor by cleaning the grid periodically to allow proper flow and operation. This would be the time to inspect the combustor for damage. An important consideration when operating a stove with a catalytic combustor is “light off”. The catalytic combustor needs to be preheated to approximately 750 degrees for 20 minutes before it is engaged or brought into the path of the flue gases. Failure to achieve a proper light off is the most common user error with catalytic combustors.